On Saturdays, you can check out a snippet from my latest writing efforts. All snippets are copyrighted. These excerpts from my writing are first draft, unedited words, and may not appear in the final work. Something about the salt water here reminded her of the ocean—a sense of depth belied by the fact that she could see floating lane markers when she turned and looked down. This is definitely a swimming pool, so why does it feel like I’m deep in the ocean? Her twisting motion disturbed the hand in hers. The salty scent of water comforted her, and she lazily stretched. A soft slap hit the water and tiny droplets scattered over her body, snapping her further alert. Her arm felt sore…bruised, and she wasn’t sure why. The hand holding hers tightened, and that sensation, too, felt familiar. Then why did she suddenly feel so forlorn? Maryn… Hearing her name brought back her awareness of self instead of all these disjointed memories of the past. She needed to be concerned with where she was and how she arrived here, not with high school swim competitions. More than the words she heard, the sound of that voice triggered so much more remembrance. Long-buried memories—of anger, lies, and betrayal—flooded her at the sound of that rasping whisper, and she wrenched her hand away, pressing it to her head and trying desperately to will away the crashing thoughts. A cry of pain—not hers—accompanied her movement, but Maryn couldn’t focus on it as confusing images flickered through her mind. She saw flashes of dark hair and a dark complexion, and her heart throbbed with agonizing recognition. Was this the face of one she’d lost? Was it someone she loved? Or was it someone who hurt her? Maryn’s a bit confused. Have you ever woken up not knowing where you are? A short story of mine titled “A Step Through Time” has been accepted to an anthology, “Five Minutes at Hotel Stormcove.” Atthis Arts will be publishing this collection in May, 2019. I am so honored to have my work chosen for this special collection. Through the editing process, I’ve gotten a sneak peek at some of the stories that are included, and you are in for a real treat. The premise of the anthology is that the entire story must take place in five minutes, and the story must also occur somewhere on the premises of Hotel Stormcove. 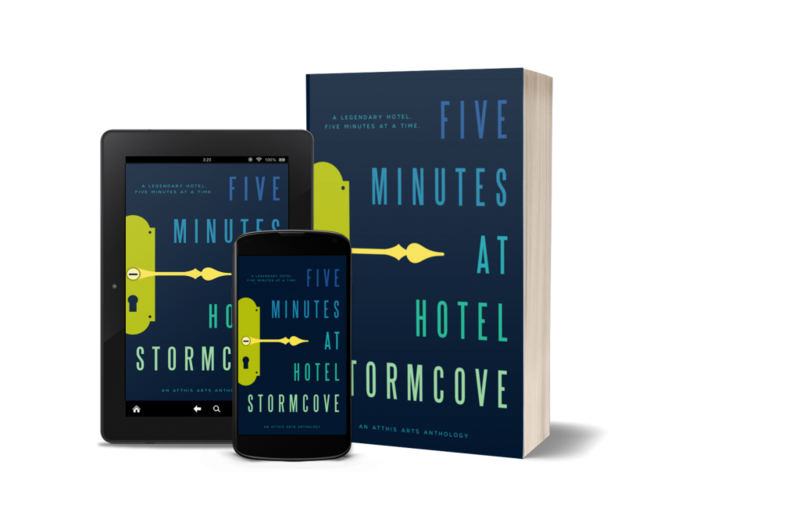 Pre-order your copy of “Five Minutes at Hotel Stormcove” here. Why is a little winged boy shooting arrows one of the symbols of love on Valentine’s Day? In some versions of his mythology, Cupid (or Eros) could shoot with one of two arrows, the gold-tipped ones causing untamed desire and the lead ones generating aversion. Cupid famously won an archery challenge against Apollo by shooting the other god with the gold-tipped arrow and Daphne with lead. We know how that worked out for Apollo: to escape his attention Daphne turned herself into a tree. But we’re not here to talk about wood nymphs and sun gods on Valentine’s Day, especially since Apollo was traditionally unlucky in love. Like many stories in Greek mythology start, a goddess envies a mortal. In this case, Aphrodite (Venus) is jealous that three sisters are celebrated for their beauty. In particular, the youngest, Psyche, is hailed the next coming of Aphrodite, much to the goddess’s disgust. So Aphrodite sends her son to teach Psyche lesson, AKA make her life a living hell because the ancient Greek gods were vindictive monsters. She wants Cupid to shoot Psyche with an arrow so that the girl falls in love with some hideous beast. But Cupid accidentally scratches himself with his arrow and falls madly for Psyche. Meanwhile Psyche’s father receives a prophecy that Psyche’s husband will rain death and destruction on the world. Like any rational loving parent, he decides to sacrifice his daughter by leaving her on a cliff. A wind god transports her to a gorgeous garden on the edge of gorgeous magical manor. Hiding from her view, Cupid gives her various instructions that end up with them in a dark bedroom. He forbids her to look at his face. Night after night, they tryst in the darkness, and he leaves before dawn. Her older sisters, who might have been jealous of Psyche’s change of fortune, recite the prophecy of the awful winged creature back to her and urge her to do something about the monster that she’s taken to her bed. So one night, intent on seeing then killing the beast (so she’s both Belle and Gaston here), Psyche hides an oil lamp and a dagger that she takes out after Cupid falls asleep. But instead of a monster, she sees a—ahem—hot naked angel™. She’s so shocked to find this perfect specimen of male beauty in her bed that she bumps into his quiver, wounds herself on an arrow, and is so beset by passion that she shakes the oil lamp, burning Cupid and awakening him. And now the hot naked angel™. is full of wrath that she betrayed his trust. So Cupid flies away and Psyche (who is now pregnant, by the way) tries to follow him, but she fails. Because, duh, she’s a mortal and can’t fly. Cupid decides to nurse his wounds at his mother’s house, where Aphrodite finds that her son failed to punish Psyche like she originally wanted. So the goddess takes her revenge, violently torturing Psyche before fashioning a series of trials, which Psyche completes mainly because all these random things (ants, reeds, eagles, towers) decide to help her. I guess they don’t much care for Goddess of Beauty either, and besides that, Psyche has endeared herself to some of the other gods who want to help her because she’s not actually this horrible person Aphrodite’s making her out to be. —like Pandora—can’t resist opening the box to claim some of this treasure for herself. But the box, purportedly containing beauty, actually holds the sleep of death, which makes me wonder why Persephone wanted to kill Aphrodite or, more philosophically, if death is the only way to permanently capture the memory of beauty. Now a healed Cupid comes upon Psyche, apparently defying his mother yet again. We should totally forgive him for ignoring his lover up to now, leaving her in her time of need, and letting his mother abuse her, and suddenly remember that Psyche broke his trust and he’s the wronged one in all of this. And if none of those reasons work for you, I’ll remind you he’s a hot naked angel™ (and a spoiled ancient Greek god). So he comes to her rescue because he was struck by own arrow, hoisted by his own petard, so to speak, and still loves Psyche. Cupid removes the sleep from Psyche’s face (which smacks of Sleeping Beauty to me) takes her and the box to his mom, and then goes to make his case to Zeus to let him marry Psyche, make her a goddess, and protect her from further scheming by her new mother-in-law. And they live immortally ever after. Not sure if this makes you feel better or worse about Cupid as a symbol of Valentine’s Day, but if you don’t want to think about cherubic babies pointing sharp objects at you, you can always instead envision a hot naked angel™.